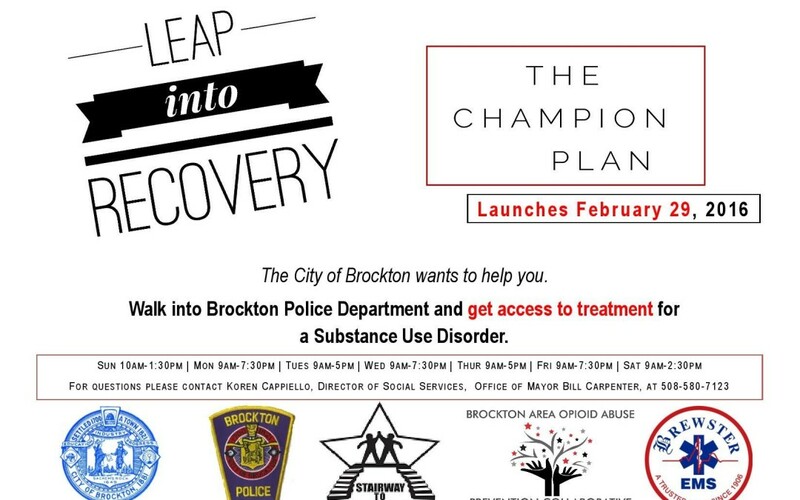 The Champion Plan is an addiction outreach program in Brockton that will launch Monday. The police-assisted outreach plan is meant to help place addicts who want help into addiction treatment facilities. Modeled after a similar program in Gloucester, addicts asking for help will receive it. Brockton’s police headquarters will serve as the drop-in center. The only way to enter the program is by going to the Police Department, where a designated specialist will assist the addict and/or their family. From there, Brockton-based addiction resource group Stairway to Recovery will provide volunteers, who are in recovery themselves, to support the people entering into the program. They will be taken to the Stairway to Recovery office, which will serve as a safe haven while they are waiting to get into a treatment facility. Once a bed at one of the six area treatment centers participating in the program is available, Brewster Ambulance will take the person from Stairway to Recovery to the facility to begin their treatment. Those who want to participate will not be able to go directly to Stairway to Recovery and must begin the process at the Brockton police station. Any addict in Brockton who is seeking treatment is encouraged to take part in the Champion Plan. Non-residents of the city will also be accepted. Even though the plan intends to serve all who ask for help, Brockton residents will be given preference. Be aware, those who have active warrants for their arrest will be placed in custody and have to go before the court before entering the program. By law, the police have to arrest those with outstanding warrants. But once the warrants are cleared, they can enter the treatment program. People are asked to discard any drugs or drug paraphernalia before going into the police station. The Police Department is located at 7 Commercial St. near downtown and between Court and Centre streets. The main entrance is at the top of a winding one-way ramp that also serves as a drop-off point for the downtown commuter rail station. Visitor parking is to the right of the building at the top of the ramp. People are asked to park in marked visitor spaces and to not block the road since it is used as an emergency road for the police.Those coming from Route 24 should get off at Exit 17A toward Brockton. Follow Belmont Street (or Route 123) for about three miles until the road ends at Main Street. Turn left onto Main Street and take your first right onto Crescent Street (Route 27). After about a quarter-mile on Crescent Street, turn left onto Commercial Street and look for the Police Department on your left. Why start the plan now? While planning for the Champion Plan began last year, the initiative was announced Jan. 15 by Mayor Bill Carpenter after a potent batch of heroin forced first responders to treat 40 overdoses in a four-day span, including 16 overdose calls in one day. Last year the city averaged about two to three overdoses in a day. Police are finding more of the powerful painkiller fentanyl being used and sold in the city and believe users are mixing the narcotic with heroin or using it on its own. Fentanyl is 50 to 100 times more potent than heroin. The aim of the Champion Plan is to expand resources for addicts rather than putting them behind bars – a plan similar to the groundbreaking approach put in place by the Gloucester Police Department last year and a program that launched in October in East Bridgewater. Since starting last June, the Gloucester Police Department’s Angel initiative has helped place 400 people into treatment. In East Bridgewater, 35 people have been placed at treatment facilities. The Brockton plan has similarities to both programs. One difference, however, will be that each person seeking help will be asked if he or she has served in the military. Those eligible for VA care will be sent to Brockton’s Veterans Affairs Medical Center, freeing up a bed at another local treatment center. The VA hospital has an overnight treatment facility for mental health and substance abuse with 123 beds.